A TLS/SSL handshake failure occurs when a client and server cannot establish communication using the TLS/SSL protocol. When this error occurs in Apigee Edge, the client application receives an HTTP status 503 with the message Service Unavailable. You see this error following any API call where an TLS/SSL handshake failure occurs. Select the cryptographic algorithm to be used. If the TLS/SSL handshake succeeds, then the TLS/SSL client and server transfer data to each other securely. Otherwise, if a TLS/SSL handshake failure occurs the connection is terminated and the client receives a 503 Service Unavailable error. The steps in this section are for Edge Private Cloud and Edge Public Cloud users. A TLS/SSL handshake failure occurs if the protocol used by the client is not supported by the server either at the incoming (northbound) or outgoing (southbound) connection. See also Understanding northbound and southbound connections. Determine whether the error occurred at the northbound or southbound connection. For further guidance on making this determination, see Determining the source of the problem. If you are a Private Cloud user, then you can collect the tcpdump data at the relevant client or server. A client can be the client app (for incoming, or northbound connections) or the Message Processor (for outgoing, or southbound connections). A server can be the Edge Router (for incoming, or northbound connections) or the backend server (for outgoing, or southbound connections) based on your determination from Step 1. If you are a Public Cloud user, then you can collect the tcpdump data only on the client app (for incoming, or northbound connections) or the backend server (for outgoing, or southbound connections), because you do not have access to the Edge Router or Message Processor. See tcpdump data for more information on using the tcpdump command. Analyze the tcpdump data using the Wireshark tool or a similar tool. In this example, the TLS/SSL handshake failure occurred between the Message Processor and the backend server (the outgoing, or southbound connection). Message #4 in the tcpdump output below shows that the Message Processor (Source) sent a "Client Hello" message to the backend server (Destination). Message #5 shows that the backend server acknowledges the "Client Hello" message from the Message Processor. The backend server immediately sends Fatal Alert : Close Notify to the Message Processor (message #6). This means the TLS/SSL Handshake failed and the connection will be closed. Because there is a mismatch between the protocol used by the Message Processor and the backend server, the backend server sent the message: Fatal Alert Message: Close Notify. Upgrade your backend server to support the TLSv1.2 protocol. This is a recommended solution as the protocol TLSv1.2 is more secure. If you configured a target server for your proxy, then use this management API to set the protocol to TLSv1.0 in the specific target server configuration. You can see a TLS/SSL handshake failure if the cipher suite algorithm used by the client is not supported by the server either at the incoming (northbound) or outgoing (southbound) connection in Apigee Edge. See also Understanding northbound and southbound connections. Analyse the tcpdump data using the Wireshark tool or any other tool that you are familiar with. In this example, the TLS/SSL Handshake failure occurred between the Client application and Edge router (northbound connection). The tcpdump output was collected on the Edge router. The message #4 in the tcpdump output below shows that the client application (source) sent a "Client Hello" message to the Edge Router (destination). Selecting the Client Hello message shows that the client application is using the TLSv1.2 protocol. Message #5 shows that the Edge Router acknowledges the "Client Hello" message from the client application. The Edge router immediately sends a Fatal Alert : Handshake Failure to the client application (message #6). This means the TLS/SSL handshake failed and the connection will be closed. The Edge Router supports TLSv1.2 protocol. This means that the protocol matches between the client application and the Edge Router. 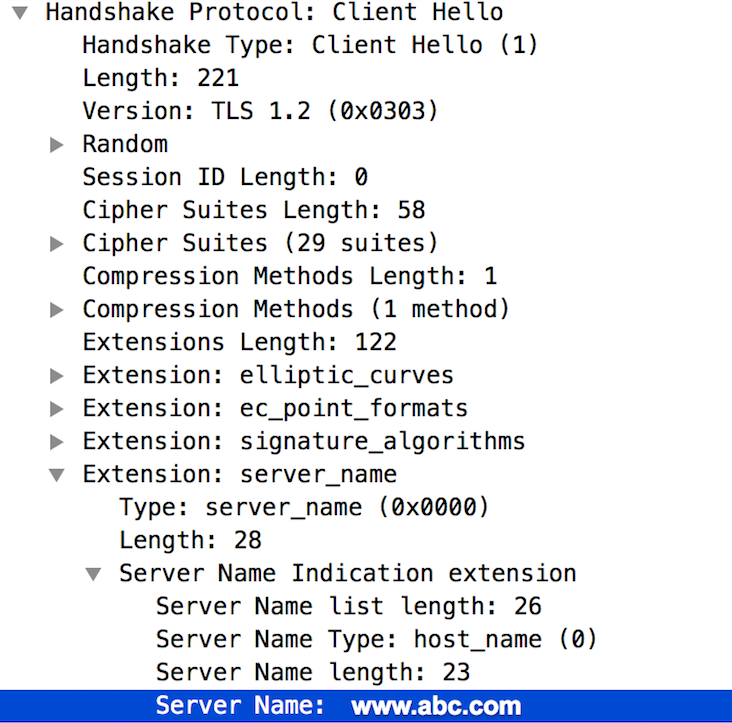 The client application is not using the cipher suite algorithms supported by the Edge Router. The Edge Router is SNI-enabled, but the client application is not sending the server name. The list of cipher suite algorithms supported by the Edge Router are listed in the /opt/nginx/conf.d/0-default.conf file. In this example, the Edge Router supports only the High Encryption cipher suite algorithms. The client application does not use any of the High Encryption cipher suite algorithms. This mismatch is the cause of the TLS/SSL handshake failure. If this name is valid, you can infer that the TLS/SSL handshake failure has occurred because the cipher suite algorithmss used by the client application are not supported by the Edge Router. You must ensure that the client uses the cipher suite algorithms that are supported by the server. To solve the issue described in the previous Diagnosis section, download and install the Java Cryptography Extension (JCE) package and include it in the Java installation to support High Encryption cipher suite algorithms. A TLS/SSL handshake failure occurs if you have incorrect certificates in the keystore/truststore, either at the incoming (northbound) or outgoing (southbound) connection in Apigee Edge. See also Understanding northbound and southbound connections. If the problem is northbound, then you may see different error messages depending on the underlying cause. The following sections list example error messages and the steps to diagnose and resolve this issue. Hostname Mismatch The hostname used in the URL and the certificate in the keystore of the router does not match. For example, a mismatch occurs if the host name used in the URL is myorg.domain.com while the certificate has the hostname in its CN as CN=something.domain.com. Note: The steps in this section can be performed by both Edge Private and Edge Public Cloud users. Get the details of the certificate in the keystore using the Edge management API. The subject name in the primary certificate has the CN as something.domain.com. Because the hostname used in the API request URL (refer to step#1 above) and the subject name in the certificate don't match, you get the TLS/SSL handshake failure. Obtain a certificate (if you don't have one already) with an existing subject CN, but use your-org.your-domain as a subject alternative name, then upload the complete certificate chain to the keystore. Validate the certificate and its chain and verify that it adheres to the guidelines provided in the article How certificate chains work to ensure it's a valid and complete certificate chain. If the certificate chain stored in the keystore is either incomplete or invalid, then you see the TLS/SSL handshake failure. Obtain a certificate (if you don't have one already) that includes a complete and valid certificate chain. Upload the validated certificate chain to the keystore. If an incorrect/expired certificate is sent by the server/client either at the northbound or at the southbound connection, then the other end (server/client) rejects the certificate leading to a TLS/SSL handshake failure. Analyze the tcpdump data using Wireshark or a similar tool. From the tcpdump output, determine the host (client or server) that is rejecting the certificate during the verification step. You can retrieve the certificate sent from the other end from the tcpdump output, provided the data is not encrypted. This will be useful to compare if this certificate matches with the certificate available in the truststore. Review the sample tcpdump for the SSL communication between the Message Processor and the backend server. The Message Processor (client) sends "Client Hello" to the backend server (server) in message #59. The backend server sends "Server Hello" to the Message Processor in message #61. They mutually validate the protocol and cipher suite algorithms used. The backend server sends the Certificate and Server Hello Done message to the Message Processor in message #68. The Message Processor sends the Fatal Alert "Description: Certificate Unknown" in message #70. The backend server's certificate and its complete chain are all available underneath the "Certificates" section, as shown in the above figure. Check if the certificate stored in the truststore of the Router (northbound) or Message Processor (southbound) matches with the certificate that is stored in the keystore of the client application (northbound) or target server (southbound), or the one that is obtained from the tcpdump output. If there's a mismatch, then that's the cause for the TLS/SSL handshake failure. Check if the certificate stored in the keystore of the Router (northbound) or Message Processor (southbound) matches the certificate stored in the truststore of the client application (northbound) or target server (southbound), or the one that is obtained from the tcpdump output. If there's a mismatch, then that's the cause for the SSL handshake failure. Verify that the certificate in the keystore of the appropriate host is expired. To resolve the issue identified in the example above, upload the valid backend server's certificate to the trustore on the Message Processor. The following table summarizes the steps to resolve the issue depending on the cause of the problem. Certificate stored on the keystore of the router is expired. Certificate stored on the keystore of the client application is expired (2-way SSL). Upload a new certificate and its complete chain to the keystore on the appropriate host. Certificate stored on the keystore of the Target Server is expired. Certificate stored on the keystore of the Message Processor is expired (2-way SSL). 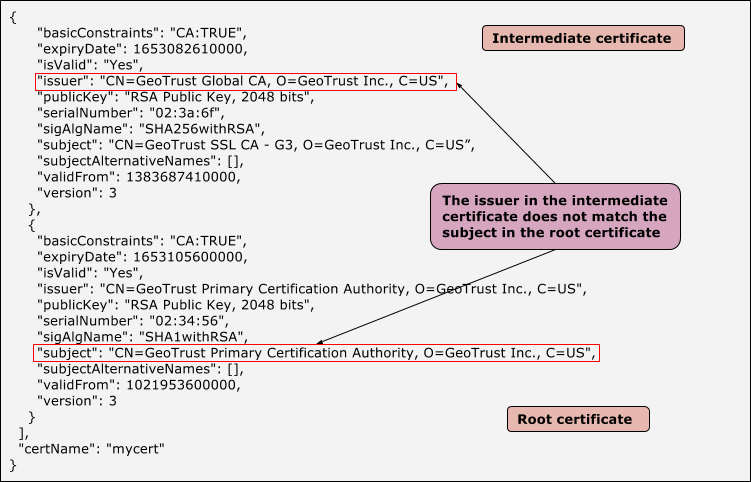 Certificate stored on the truststore of the client application does not match the Router's certificate. Certificate stored on the truststore of the router does not match the client application's certificate (2 way SSL). Upload the valid certificate to the truststore on the appropriate host. Certificate stored on the truststore of the target server does not match the Message Processor's certificate. Certificate stored on the truststore of the Message Processor does not match the target server's certificate (2-way SSL). The TLS/SSL handshake failure can occur when the client is communicating with a Server Name Indication (SNI) Enabled Server, but the client is not SNI enabled. This could happen either at the northbound or the southbound connection in Edge. First, you need to identify the hostname and port number of the server being used and check if it is SNI enabled or not. If you get a handshake failure in step #1 or get different certificates in step #1 and step #2, then it indicates that the specified Server is SNI enabled. Once you've identified that the server is SNI enabled, you can follow the steps below to check if the TLS/SSL handshake failure is caused by the client not being able to communicate with the SNI server. Analyze the tcpdump output using Wireshark or a similar tool. In this example, the TLS/SSL handshake failure occurred between the Edge Message Processor and backend server (southbound connection). The message #4 in the tcpdump output below shows that the Message Processor (source) sent a "Client Hello" message to the backend server (destination). 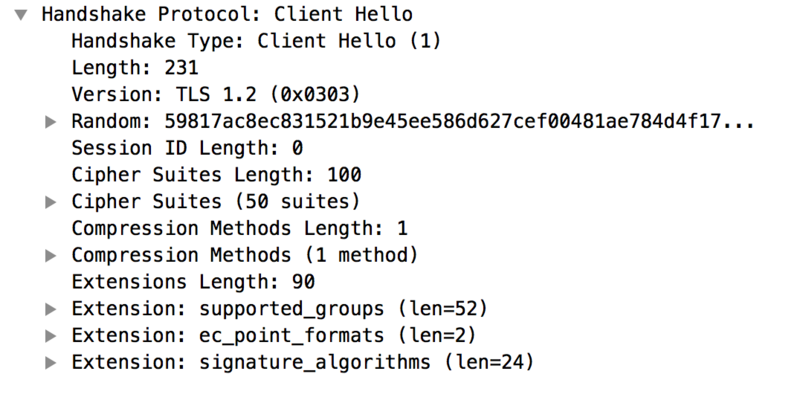 Selecting the "Client Hello" message shows that the Message Processor is using the TLSv1.2 protocol. The message #4 shows that the backend server acknowledges the "Client Hello" message from the Message Processor. The backend server immediately sends a Fatal Alert : Handshake Failure to the Message Processor (message #5). This means the TLS/SSL handshake failed and the connection will be closed. The backend server does support TLSv1.2 protocol. This means that the protocol matched between the Message Processor and the backend server. The Message Processor is not using the cipher suite algorithms supported by the backend server. The backend server is SNI enabled, but the client application is not sending the server name. This confirms that the Message Processor did not send the server_name to the SNI-enabled backend server. This is the cause for the TLS/SSL handshake failure and the reason that the backend server sends the Fatal Alert: Handshake Failure to the Message Processor. Verify that the jsse.enableSNIExtension property in system.properties is set to false on the Message Processor to confirm that the Message Processor is not enabled to communicate with the SNI-enabled server. Create the/opt/apigee/customer/application/message-processor.properties file (if it does not exist already). If you have more than one Message Processor, repeat the steps #1 through #4 on all the Message Processors. If you are unable to determine the cause for TLS/SSL Handshake failure and fix the issue or you need any further assistance, contact Apigee Support. Share the complete details about the issue along with the tcpdump output.